The Japanese yen has hit an eight-month high against the dollar - denting the share prices of many exporters. The currency reached 88.23 yen per dollar - the highest since January's 13-year high of 87.10. A stronger yen makes Japanese exports less competitive - but makes imports more affordable to Japanese consumers. Observers said the strengthening of the yen came after comments suggesting that the likelihood of Japan intervening to weaken its currency had receded. In the past, Japan has stepped into the currency markets to weaken the yen when the government thought its rise was threatening growth in the world's second-largest economy. 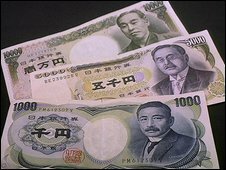 The authorities have not intervened since 2005, but some observers had believed finance minister Hirohisa Fujii could step in to halt the yen's strengthening. However, Mr Fujii told the Dow Jones newswire that that "foreign exchange dumping" to defend Japanese exporters would be the wrong policy. "It would be a mistake to artificially influence foreign exchange rates," Mr Fujii was quoted as saying. Mr Fujii became finance minister after the Democratic Party of Japan (DPJ) last month ended more than 50 years of almost unbroken rule by the Liberal Democratic Party. Earlier this month, he said a strong yen had merits, but he has backed down from this view as the rise has gained momentum. Honda Motors and electronic parts maker Kyocera were among the exporters seeing their shares lose ground on Monday. The benchmark Nikkei index fell 256.46 points to 10,009.52 - its lowest close since late July. It also hit a two-month intraday low of 9,971.05.